Once, my little sister Mary Kate and I had a taco eating contest. I was 22 years old at the time, she was only 13. Anyone who knows Mary Kate knows that this pint sized little scrap can pack in grub like Nacho Libre. She deserves to be roly-poly, double chinned and plumpy-gordita; instead she wrangles all that food into her size 2 jeans and begs for dessert. To challenge her to an eat-a-thon was folly on my part, but I'd been out of the country for a year and she's so skinny that I must have forgotten. It was all I could do to keep up, so I made my tacos smaller and smaller. At the end of the night, the tally was seven and 1/2 tacos each. At least that's how it's remembered in the annals of family history. I was too full to do el math-o. Happy Cinco De Mayo! Enjoy all of your food, especially the tacos. Make them as big and full as you want. No one is counting. Sprinkle steak on both sides with 1/2 teaspoon each salt and pepper. Place steak in zip top bag. Add garlic, lime juice, salsa, oil, and chili powder. Zip up bag and massage mixture (from the outside of the bag) into meat. Let marinate for at least one hour and up to overnight. Grill steak, for about four minutes per side for medium. Let rest for five minutes. Slice on the bias. Meanwhile, grill tortillas and wrap in slightly moist dishcloth until serving time. For slaw: In a large bowl, combine slaw mix, tomatoes, cilantro, lime juice, and olive oil. Season to taste with salt and pepper. 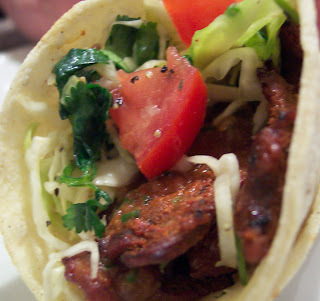 To serve, divide meat slices and slaw between tortillas. (To be authentic, use two tortillas together.) Add cheese, sour cream, salsa, and guacamole as desired. I'm licking my chops and salivating and I'm a vegetarian!!! I can't wait to eat!!!! I'm so glad I'm celebrating el cuatro de Mayo! Size 2 jeans, yeah right! I am no size 2 but I do love to eat. I cannot believe how super delicious these tacos look! I have always loved tacos(obviously eating 7 1/2 will testify of that) but I love them even more now as and adult. I'm pretty sure I could beat that old record or at least have a great time trying! Keep up the fabulous work! You're amazing! Ooooooooh my goodness this looks so very very good. Now I'm drooling. Those tacos look muy delicioso! I'm craving them now. Thanks for your blog, P.P. It's such fun to visit. I don't want to come over to visit. I don't even want to come out and play. I want to move in. Everything looks DELICIOUS. You've got to do a cookbook, "Barefoot Contessa" style. Your recipes and pictures are just as beautiful as hers. She always uses friends and family pictures too, so we could sit in my red convertible eating, colorful tacos, and dark delicious brownies. I love the new blog, and the song was perfect. All the songs are, but I've heard you sing the Cake song so many times when someone has come over that it made me laugh the moment I heard it. Everything does look good on your blog. These tacos look so tasty. I'm going to try your salsa though. I weep for you I deeply sympathize, for I've enjoyed your company much more than you realize! Little Tacos, little Tacos, but answer there came none. And this was scarcely odd because they'd been aten, everyone! Oh Prudy, prudy, prudy, three words. thankyou, Thankyou, THANKYOU! Everything was so delicious. In case you can't tell, I just finished my cuatro de Mayo, feast. I am competely intoxicated on food! I have stuffed myself so full that I cannot walk, talk, breathe, or move, and it's so glorious! Thankyou Prudy, for all the delicious recipes. I suppose I need to roll myself down the stairs and go help my children. I said it once and I'll say it again, THANKYOU THANKYOU THANKYOU! I'm so glad you enjoyed your dinner, dear little walrus. Leftovers will be grand, too. MK-size 2, size 4, what's the diff? Ice cream: Come back tomorrow from homemade sherbet! Gracias! I'm glad you're back for more. Any requests??? I do have a spare bedroom. I could clean it out this weekend. I tried the bbq chicken sandwiches. DELICIOUS! My daughter loved them too! Can't wait to make them again. As for the salsa... My good friend's mom is from Guatemala. She has lived her for like 30 years, but all her family is in Guatemala still. She has these amazing spice packets that you add to a can of whole tomatoes and some cilantro and waaalaaah... you have the most amazing salsa. She sells them. The name is Mayan Treasure and the packets are 3 for $5. The chili's and spices are authentic and from Guatemala. She goes out there often to restock. So, if you ever want to try it out I can link you to her. The packets are also amazing to add to black beans or tacos etc. Send me a link! Hook me up with the good Guatemalan spices! I'm so glad you and your cute little girl enjoyed the BBQ sandwiches. I can't wait to try the Mayan Treasure Salsa, too.